uniform for the next 4 seasons to the tune of $50 million. Papelbon was drafted by the Boston Red Sox in the 4th round of the 2003 draft and came up through the farm system, first landing in Boston in 2005. 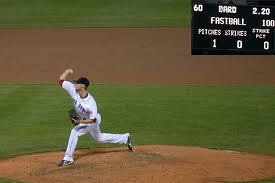 He was the Red Sox closer from 2006-2011 and helped bring one World Series title to Boston in 2007. 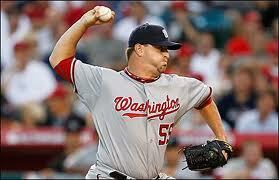 In seven professional seasons, Papelbon has a 23-19 record, 2.33 ERA, and 219 saves. He was a four-time All Star as well. With his departure, the Red Sox are left without someone to close the door in the ninth inning. Papelbon was a model of consistency for the most part coming out of the bullpen. For a time, I referred to him as the next Mo. (Mariano Rivera). For a time, whenever the Dropkick Murphy’s amplified throughout Fenway Park, there was a sense of confidence that the game was over because Papelbon was coming in to shut the door. He was usually dependable to get the last 3 outs of a game, 3 outs that most baseball pundits say are the toughest outs of any ball game. Boston fans should be grateful for the time Papelbon gave the organization but they shouldn’t be overly upset that he is gone. Jonathan Papelbon left Boston as fast as he possibly could. In theory, he couldn’t wait for the end of the 2011 season to arrive so he could grab the first ticket out-of-town. This can be inferred by the fact that he didn’t wait to see if Boston would match or trump Philly’s generous offer. That he signed so early in the free agent period and didn’t wait for a market to be set for him, is a testament to the fact that he wanted out as soon as possible. To be honest, it was time for Pap to take his talents elsewhere. Personally, my lasting memories of Pap in a Red Sox uniform are not of him doing an Irish Jig with a Bud Light box on his head after the Red Sox clinched a playoff berth. My lasting memories of Pap are his blowing a 3 run lead in Game 3 of the 2009 ALDS to the Angels. My lasting memories of Pap are his blowing the Red Sox opportunity at making the playoffs in 2011 by getting lit up by the Orioles with 2 outs in the ninth inning. In an effort to putting a Red Sox fan’s mind at ease, I will pose this question. When was the last time a free agent closer, who demanded a big contract panned out for their signing team? Francisco Rodriguez’s 3 year $37 million contract was a disaster with the Mets. Brad Lidge signed a 3 year extension with the Phillies for the same $37 million that K-Rod signed with the Mets and other than 1 great year, his other 2 were riddled with injuries. My point is that it’s generally not a good idea to pay a closer an exorbitant amount of money unless his name is Mariano. While some may argue that the closer is one of the most important parts of a team, I counter that they are getting paid to essentially get three outs. At the end of the day three outs is three outs. Three outs in the 1st inning is the same as 3 outs in 5th inning is the same as getting 3 outs in the ninth inning. I do not buy into the theory that closers should be paid more than $10 million a year. So now with Papelbon gone the Red Sox will need to replace him. Their in-house options include Daniel Bard and Bobby Jenks. Bard was excellent most of last year before hitting a rough patch in September. Then again, who on the Red Sox didn’t have a bad September other than Marco Scutaro? Jenks is still under contract for next year but does have health concerns. Kyle Weiland was quite effective last season his first time through an opponents lineup. One could argue that he would be ideal for the closer’s role citing the theory that he shouldn’t have to go through a lineup to do his job. Michael Bowden pitched well in Triple A Pawtucket last season. In 52 innings he posted a 2.73 ERA with 16 saves. Yet he has failed to impress at the Major League level. Looking outside the organization the names that immediately spring to mind are Heath Bell, Ryan Madson, Matt Capps, Joe Nathan, Francisco Cordero, and Jonathan Broxton. Bell and Madson would probably command the most money and we all know I am not a fan of throwing big money at closers. Joe Nathan has been injury prone for the last 2 seasons and isn’t getting any younger at the age of 37. Jonathan Broxton is a 300 pounder that put up a Lackey-like ERA of near 6 this past season with the Dodgers. While Cordero had a solid season in Cincinnati, he is 36 years old and not a viable option for a multi-year contract. Out of this group Capps is the most attractive. He is 28, has a career ERA of 3.51, and gives up about a hit an inning (410 innings pitched/ 411 hits). I would think the Red Sox would be able to get him for 3 years $25 million. He might not be the sexiest option out there but he does his job. Other names to kick around as potential Papelbon replacements: Francisco Rodriguez, Jon Rauch, Frank Francisco, and David Aardsma. Rodriguez has way too much baggage and is known as a drama queen in clubhouses from New York to Milwaukee. Bringing him to Boston would be throwing gasoline on a fire. Rauch is 6’10 and quite intimidating on the mound, but that’s about it. Francisco is best known for throwing a bullpen chair into the stands during a brawl in Texas and Aardsma was in Boston before and wasn’t impressive in my humble opinion. 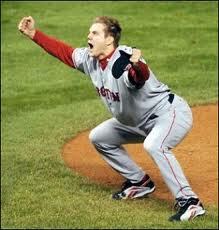 There is a part of me that will miss Papelbon coming into the game to the Shipping up to Boston song. There is a part of me that will miss his stare into the catcher to get his sign. I will miss the emotion that he brought to the game. I will also miss how he was up front about his failures as much as his successes. 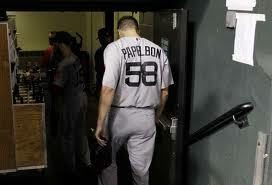 But all good things come to an end and for Jonathan Papelbon and the Boston Red Sox that time is now. Saying “collection” would imply that he had more than one ring. Sadly, he in fact only has one ring. right? it’s infuriating. YOUR WEDDING RING DOES NOT COUNT, PAPS.